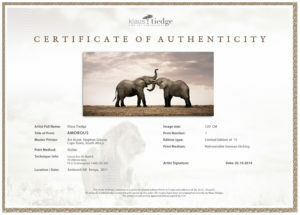 Original print of the Pride of Africa Collection – personally numbered, signed and authenticated by artist Klaus Tiedge. Small group of elephants is walking across the plains of Amboseli in Kenya. Dramatic clouds and the vertical frame give it an interesting perspective. Wonderful timeless piece of art which fits with many decorative interior styles of offices and homes. 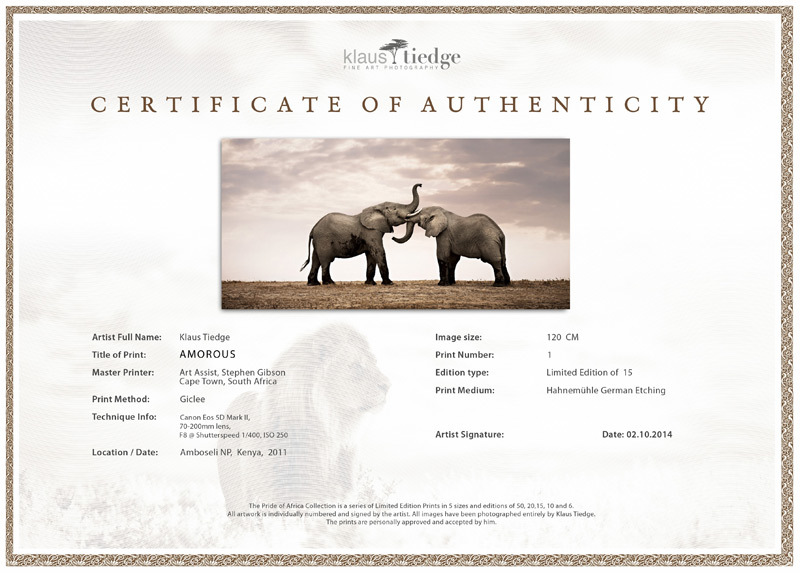 It was that one-day in a thousand days when we entered Kenya’s Amboseli National Park. The warm air and the reflecting sun on the dry soil while above a beautiful conglomeration of clouds packed together. We sat in an old Range Rover, air condition long since no more, a dry breeze blowing through the open windows. The dust that creeps into every corner and my photo equipment is safely covered. I stopped to look through my binoculars, on the horizon a small elephant group appeared. The elephants in this area are different as when marching by in large herds, one feels the majesty with which the big colossus moves. They really belong to this place. After a few days in this area you realize departing from the world you came from and touch base with nature, the animals and your own serenity … an overwhelming experience. When this scene evolved, the small group of elephants came closer; it was only my camera, the elephants and I. They looked like three stragglers; I repositioned myself slightly to gain a different angle to those great creatures. A vertical frame for this image emphasizes the special and interesting perspective of the scene. Although close to us, they appeared smaller as I chose to give the sky and the dramatic clouds the dominant space. This shot concludes my love for being out there … the depths of space represents a calmly atmosphere and a wide space of virginity, a special feeling only experienced in the wild.